These are the kinds of incidents we can expect more of under the unconstitutional Arizona immigration power-grab and racial profiling law. LOS ANGELES — The family of a mentally disabled man claims that the federal and local governments mistakenly had an American citizen deported and said U.S. officials should help find him in Mexico. Relatives of Pedro Guzman, 29, are suing the Department of Homeland Security and the Los Angeles County Sheriff’s Department in Los Angeles federal court. The American Civil Liberties Union filed suit this week over what the civil rights group contends was the wrongful deportation of a developmentally disabled man. He said Michael can’t read, gets lost and often can’t remember the family phone number. The suit said Pedro Guzman was sentenced in April to 120 days in jail for a misdemeanor trespassing violation. The suit said that sometime after that the Sheriff’s Department identified him as a non-citizen, obtained his signature for voluntary removal from the United States and turned him over to federal authorities for deportation. Guzman, who knows no one in Tijuana, was last heard from on May 11, when he phoned his brother and sister-in-law’s home to say he had been deported to that city, but the call was interrupted before he could say exactly where he was, according to the ACLU. Guzman’s mother, brother and sister-in-law traveled to Tijuana and searched shelters, jails, churches, hospitals and morgues, but have not found him and fear for his safety, ACLU officials said. Mark Rosenbaum, the legal director of the ACLU’s Southern California branch, said in a statement. There are no circumstances under which a U.S. citizen can legally be deported. Austin, TX became the latest in a growing list of cities that are boycotting Arizona in some capacity to protest the law, which makes it a state crime to be in the country illegally and requires local law enforcement to ask for documentation from people they suspect are in the country illegally. Santa Cruz has suffered an incident of mass vandalism that is being labeled an “anarchist riot” in the news media. Cowardly and misguided individuals appeared at an un-permitted “May Day party” in Downtown Santa Cruz with masks, spray cans, paint bombs and rocks to destroy the message of international workers’ rights. Instead they terrorized and destroyed our city, for the name of what exactly I’m not at all clear. These nut jobs smashed a series of windows and sprayed anarchist graffiti on local businesses after turning a workers’ rights rally into a riot. Whatever misguided notions they have about anarchism, or whatever message they were trying to convey, was smashed right along with the glass. Compounded by that only cowards wear masks to get “the word out,” for whatever that means to them. If you have a cause that you are passionate enough to protest about, use your face and real name to stand behind this cause and not the cloak of a mask. These supposed connections between a local “anarchist’s cafe” and the madness in Downtown are weak, in my mind. Those groups are usually book clubs, not bomb-throwers and masked vandals like in some common misconceptions. But I do not speak from any personal experience on this specific group. I’ve asked around a little and nobody knows who did this. I’m going with the theory it’s just some cretins with no message at all beyond destruction and fear-mongering the public. The real tragedy here is the taint to the righteous cause of workers’ rights worldwide that started when the organizing group, who are now under FBI scrutiny, refused to gather the proper permit. I can report that unnamed local leaders were urging these people to file for the permit, hoping to close the open door to incidents like this one. I think the poor police response time is the real story here. Reportedly, police were led away from the rally by a pair of false 911 calls designed to distract them from the situation brewing Downtown; however, according to multiple eyewitnesses (of which I am not one) as well as the included YouTube video the police took over an hour to respond. “We don’t think this was an unsophisticated group of protesters; we think this is an organized group of anarchists,” Santa Cruz Police spokesman Zach Friend said Monday, adding that investigators believe the anarchists had sought to strain city resources. In the Political Internet this riot is being framed as having some connection to liberal progressives by the far right-wing. This is entirely untrue and goes to show how little these misguided conservatives understand how liberals feel about might-makes-right kind of messages like terrorizing people with riots and the mass destruction of property. Whatever Free Speech you want to spread is fine, and odds are we’ll disagree about something somewhere, but making threats, inciting violence, destroying property and wearing masks is just the tactics of terrorists and fascists. Eleanor Roosevelt with the Spanish version of the Universal Declaration of Human Rights. The Arizona Senate and Arizona Governor Jan Brewer have passed an unconstitutional and pro-racial profiling law that has sparked intense debate across the nation over the issue of illegal immigration. The law was written to pander to racist elements in the Republican Party and on the political right-wing. It does nothing to solve the problem, and creates a police-state devoid of civil liberties. It is nothing more than lies that the federal government has done nothing about the issue, thereby making Arizona justified to pass an unconstitutional and immoral law. FOR ANY LAWFUL CONTACT MADE BY A LAW ENFORCEMENT OFFICIAL OR AGENCY OF THIS STATE OR A COUNTY, CITY, TOWN OR OTHER POLITICAL SUBDIVISION OF THIS STATE WHERE REASONABLE SUSPICION EXISTS THAT THE PERSON IS AN ALIEN WHO IS UNLAWFULLY PRESENT IN THE UNITED STATES, A REASONABLE ATTEMPT SHALL BE MADE, WHEN PRACTICABLE, TO DETERMINE THE IMMIGRATION STATUS OF THE PERSON. Revisions to the AZ SB 1070 have changed “lawful contact” to “lawful stop, detention, or arrest” which changes nothing. A “lawful stop” and a “lawful contact” is the same thing. These revisions are a waste of the nation’s time. Until the law is abolished utterly there is nothing but racism and fascist tyranny being brought forth by Arizona. This law violates the U.S. Constitution, requires that police officers engage in racial profiling (which is illegal), opens the door to endless lawsuits that will bankrupt the state, and validates the racist lies of immoral monsters in regards to undocumented workers. I stand proud with the Boycott AZ movement. Those who love freedom and love American values must boycott all Arizona tourism and encourage a complete cancellation of all events and meetings held within the state until the governor and the state senate abolish this draconian law. I also support the notion of Major League Baseball pulling out of the Phoenix All Star Game unless the state wishes to return to morality and constitutional enactment of laws. The U.S. Constitution protects persons, not just citizens. The right to be secure in your person, and not be subject to this “show me your papers” fascistic law is a foundation of our country’s values. These people spouting racism and excitedly endorsing this Arizona law are not Americans, in my view. They are the most disgusting and vile element of our society who hold no love for freedom, truth, or liberty. Is it a good idea to single out just one outlet in the manner that The Obama White House recently has in the case of removing Fox Broadcasting from the press pool? At first, I was in favor of the move to ignore the Fox Broadcasting Company by Barack Obama. His efforts to clear his name on the website “Fight The Smears” stem almost entirely from Fox. He has every right to defend himself from these smear-merchants and radical right-wing propagandist supporters. The right-wing lobby called “Fox News” (as in the cable pseudo-news) and “Fox News Talk” (as in the radio pseudo-news) is still “not a news organization” in my opinion. But I think this label should include everyone from Comedy Central to HLN to CNN to MSNBC, everyone except PBS and C-SPAN. It’s been televised tabloidism in place of televised journalism for far too long. In my view. Any White House that would send a clear signal that The Daily Show, The Colbert Report, Countdown, The O’Reilly Factor, and The Glenn Beck Show are all the same thing would be nothing but a benefit in this age of media hate & mass misinformation. These programs are not news, they are purely entertainment television. Each of these programs has an agenda, as does the network behind each. There is nothing wrong with doing agenized news. But it is dishonest and unethical to claim objectivity if you are playing toward a specific political wing, or any specific agenda. This is the greatest offense of the so-called “Fair & Balanced“ Fox Broadcasting. As a network they cater to right-wing political agendas and refuse to declare themselves as a format that promotes conservative ideology. In that case I see it as a function of false advertising on behalf of the network. All these programs, it‘s important to point out, are television propaganda toward that agenda. Which might be only the agenda to make you laugh. The broadcasting produced by this political lobby / news agency / entertainment format in only the viewing of it is not dangerous. It is taking these kinds of broadcasts as serious news formats that is problematic in a democratic society. The informed viewing of propaganda is merely educational. However, to those who refuse to see the difference between opinions and facts the viewing of the propaganda of reckless liars, there is a dangerous situation produced. It is a good move that Obama is standing up to bad journalism mixed with bad business practices, but a bad move that he singled out Fox News alone when all the news agencies screw something up. Fox News is just the biggest offender of the smears. I believe radio and satellite should remain untouched by sweeping regulations, but televised broadcasting of race baiting and McCarthyism is just too much tabloidism for me to handle. This sensationalist reporting on politics that has been going almost entirely due to Fox News is not exclusive to them, so I think it would be wise to pick out a few other agencies, perhaps CLEARCHANNEL and Comedy Central, to also declare as non-news formats. It is clear to me when a news group is run by an agenda, thus becoming more like a political lobby than a news group, but it is not clear to everyone. A President who stands for educating the public should seek to educate people on what exactly “bias” is, and hopefully shed some light on the issue. The specific near-criminal acts of failure to disclose vital information of a story committed by Fox News should be spoken of plainly and openly if not handled more severely. This tactic of isolation is my only qualm with Obama’s approach to dealing with fake news. If it is the desire of this White House to tackle the specific crimes against society that Fox has committed, then I would hope the case was made in specifics. It is my personal view that a news group, of any sort, can lose it’s status as “press” if they fail to uphold the journalistic truth as a matter of course. I believe Obama did not go far enough to fight unethical journalism and false reporting. 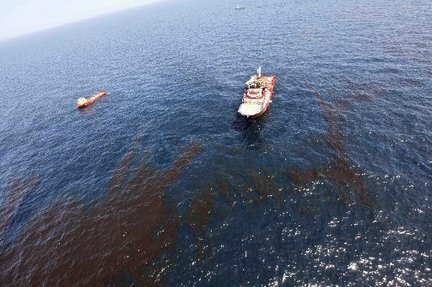 An oil-drilling procedure called cementing is coming under scrutiny as a possible cause of the explosion on the Deepwater Horizon rig in the Gulf of Mexico that has led to one of the biggest oil spills in U.S. history, drilling experts said Thursday. The process is supposed to prevent oil and natural gas from escaping by filling gaps between the outside of the well pipe and the inside of the hole bored into the ocean floor. Cement, pumped down the well from the drilling rig, is also used to plug wells after they have been abandoned or when drilling has finished but production hasn’t begun. Regulators have previously identified problems in the cementing process as a leading cause of well blowouts, in which oil and natural gas surge out of a well with explosive force. When cement develops cracks or doesn’t set properly, oil and gas can escape, ultimately flowing out of control. The gas is highly combustible and prone to ignite, as it appears to have done aboard the Deepwater Horizon, which was leased by BP PLC, the British oil giant. Federal officials declined to comment on their investigation, and Halliburton didn’t respond to questions from The Wall Street Journal. There are serious questions to be asked of Halliburton Co. and their unwillingness to talk to a source as reputable as the Wall Street Journal begs the question if indeed they do hold some serious level of responsibility in this recent oil drilling disaster.